Blog Welcome to the new Skritter blog! We’re happy to welcome you to the new Skritter blog! As you can see if you’ve visited the old blog before, things don’t look the same anymore, and that’s really good. This is the new version of the blog and while it contains all the information and inspiration about learning Chinese and Japanese that the old blog did, it will soon have much more to offer and it will be easier to find, both for new and old users. With the old platform (Blogger) we were very limited in what we could do, but with the new system (WordPress), we’re much freer and will therefore be able to give you better content presented in a more effective way. Working with the blog behind the scenes was also a pain before, but we hope that with the new blog, everything will be much easier. 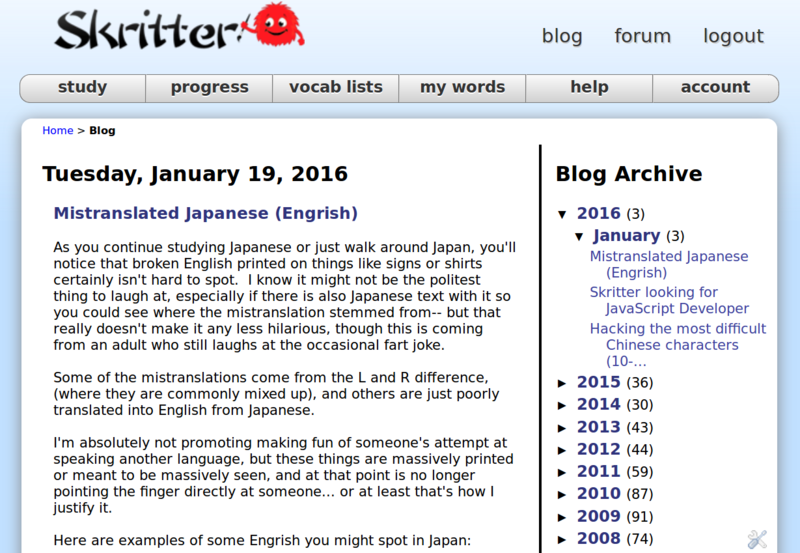 In short, we hope this will be a renaissance of the Skritter blog, both for you and us! We would also like to take this opportunity to ask what you would like to see on the blog in the future? 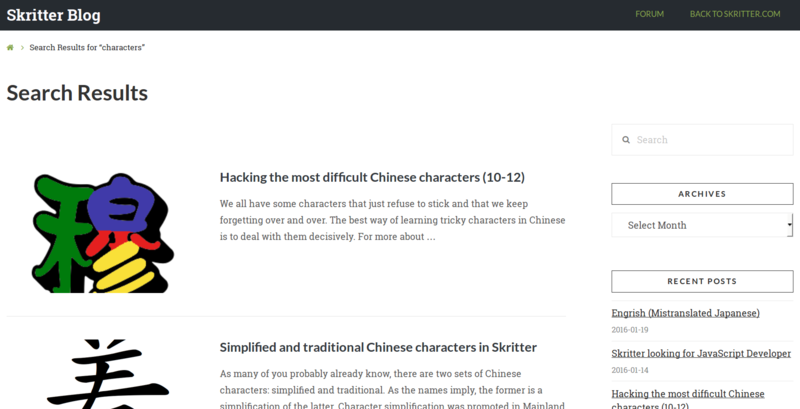 Up to now, we have published all kinds of articles focusing on some aspect of learning Chinese and Japanese, including character learning, tips for how to use Skritter more efficiently, culture, difficult characters, Skritter updates, user interviews, resource recommendations and much more. But what would you like us to write about? I have started a discussion thread on the forum, please let us know what you think! Restructuring a blog with several hundred posts is not a simple matter and there are some problems. For example, some links don’t work because the link structure on the old website was so messy and we may have overlooked some things. This means that internal links between posts and sometimes inbound links from other websites won’t point to the right article. If this happens, please let us know so that we can fix it! You can find the content you’re after by using the search box in the sidebar. Likewise, if you have other suggestions about what we should add to the blog in terms of functionality, be sure to let us know! We’re very happy to have the new blog in place and we trust that you will be to once you have grown used to it and we’ve had time to sort out some of the problems mentioned above. In the meantime, we’d like to wish you good luck with your studying and happy skrittering!